volume quota policy rule create -vserver SVMNAME -policy-name POLICYNAME -volume VOLUMENAME -type tree -target "" -threshold "-"
i) This is in line with the general design principle of making deduplication transparent to the end user. ii) It is easier for system administrators to manage quotas. They can maintain a single quota policy across all volumes, whether or not deduplication is enabled on it. iii) There are no out-of-space failures when data is being sent using SnapMirror from a volume with deduplication enabled to a destination volume that has deduplication disabled. 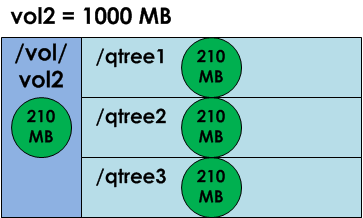 To understand the effect of seeing the logical (undeduplicated) size when using Qtree quotas, here are 3 examples. 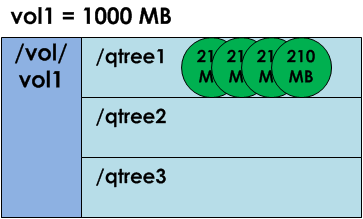 In each example, we have a 1000MB thin-provisioned volume (space guarantee none), with no snapshots, dedupe is enabled on the volume, and Qtree tracking quotas are enabled. 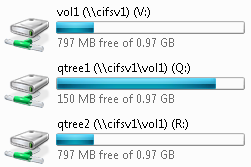 We use the same 210 MB folder multiple times (so it de-dupes very well!) The Storage Virtual Machine and AD Machine Account is called cifsv1. 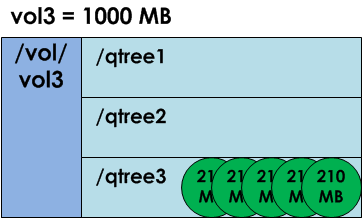 In example 1, even though the volume is only 203 MB used out of 1000 MB, if the user is accessing Qtree1, and tries to add more than 150 MB, this will fail (even though there is 797 MB free space in the volume), and the autosize will not have triggered if it were set at 850MB. Note: Interestingly, in Example 3, you might expect to see negative user space when we have 1050 MB logical data in a Qtree in a 1000 MB volume, but that doesn’t happen, the Windows client then shows the deduped data size in the volume! If your end-user is saying his share is full and he needs more space, but the volume is far from being full, nor is the aggregate, and volume autosize has not kicked in as expected, suspect dedupe and quotas!